Calais migrants: How is the UK-France border policed? Thousands of migrants determined to reach the UK live in camps near the port of Calais. In 2015, UK Prime Minister David Cameron described the sight of hundreds trying to board lorries approaching the port as "unacceptable". He said Britain and France were working together to tackle the issue - but what security is in place at Calais and what more can be done? What security do lorries pass through? 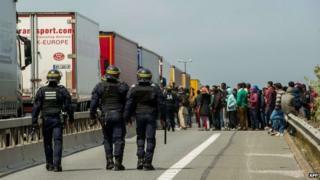 If a lorry driver suspects illegal migrants are on board - which can result in the UK imposing a £2,000 fine per stowaway - they can pull over at the port entrance, where riot police wait. Lorry driver Euan Fleming, from County Down, said the officers have guns, batons and body armour - and are therefore equipped to clear out migrants. The first official port barrier is a French security checkpoint where passports are scanned. Mr Fleming told the BBC lorries then move on to be either X-rayed or tested with a monitor which detects any heartbeats on board. He says all lorries are checked at quiet times, but it becomes a "lottery" when the port is busy because staff cannot process vehicles fast enough. Lorries then have documents checked by UK border staff and must also pass a customs checkpoint before driving on to a ferry. The port also has roving patrols of security guards with dogs and carbon dioxide detectors - which can detect raised levels caused by people breathing in the lorries. How strong is security at Calais port? The port is protected by 16ft (5m) fences topped with coils of razor wire and CCTV, with the gates and exterior guarded by heavily armed French riot police. Inside, there is a "comprehensive network of surveillance cameras", according to the port's website, and security guards patrol with dogs. In 2014, Britain committed £12m over three years to tackle the problems at Calais, and part of this is being used to build a 15ft fence along the motorway leading to the port. As well as the three-year Calais investment, the UK announced £2m extra for detection technology such as the heartbeat and carbon dioxide detectors, and £1m for more dog searches. In August 2015, the UK and France a fresh agreement on new measures in Calais, including a "control and command centre" and the deployment of 500 extra British and French police. The UK agreed to pay £7m over two years towards the new measures, in addition to money previously pledged. In January 2016 scores of migrants managed to storm a P&O ferry in the port after breaking away from a demonstration in the town. Following the incident, Interior Minister Bernard Cazeneuve said extra forces, including riot police, gendarmes and border units, had been mobilised for several months. What are French police doing? French police have been widely criticised for taking migrants off lorries, driving them a few miles away then releasing them - free to walk back to Calais. But many undocumented migrants are arrested - reportedly more than 18,000 in the first half of 2015. The problem, police say, is that there are simply too many to arrest and deal with. They also say their focus on the motorway is safety, so getting people off the road is the priority. The French authorities are also struggling to stop illegal migrants crossing into France from Italy, where tens of thousands of people are thought to have arrived by boat from Africa. What happens on arrival in the UK? Passengers arriving at Dover from Calais - by far the busiest ferry route between Britain and France - have already passed UK border controls under the juxtaposed borders system. However, border staff carry out random checks on vehicles before they leave the port. Mr Fleming said all lorries have to drive through an X-ray scanner which checks for stowaways. What does the UK government want? Mr Cameron has warned against either the UK or France "trying to point the finger of blame", saying the two countries must continue to co-operate. Mr Cameron said the migration problem must be tackled "at source" by stopping trafficking operations across the Mediterranean, and by making Britain a "less easy place" for illegal migrants to work. But Damian Collins, Conservative MP for Folkestone and Hythe, has said French authorities allow migrants to cross France "in the hope that they illegally gain entry to the UK". Mr Hanson, a Labour MP, said there must be a "joint agreement" on what happens to migrants at Calais - so they are either accepted as asylum seekers, detained or deported from France. What do French authorities say? The French government says it is speeding up the processing of asylum applications and looking to deport those who have no right to be in France. Home Secretary Theresa May told the House of Commons in 2015 that French Interior Minister Bernard Cazeneuve was "as grateful as I was for the strong co-operation" between the two countries during problems at Calais. But Mayor of Calais Natacha Bouchart has said the town is a "hostage to the British" because migrants expect better lives in the UK. She called the situation "barely manageable" and called for the UK border to be moved back to Britain. How strong is security at the Channel Tunnel? CCTV and electrified fences protect the tracks and tunnel entrance at Coquelles near Calais - though striking ferry workers got on to the track and started a fire in June 2015. It was also announced by the British government that the National Barrier Asset - a 9ft police barrier - had been deployed to the lorry terminal at Coquelles. The barrier was still there in March 2016. As with ferries from Calais, the UK and France operate juxtaposed controls on Channel Tunnel trains - so passengers must pass UK border checks before travelling. UK border staff can also travel on trains to carry out extra checks. What happens if the UK leaves the EU? Security in Calais has become an argument between opposing campaigns ahead of the UK's referendum on EU membership, which will be held on 23 June. French economy minister Emmanuel Macron told the Financial Times the country could end the so-called Le Touquet agreement - which lets UK border guards check passports on the French side of the border - if Britain left the EU. However, Leave campaigners dismissed the comments as "scaremongering". It comes after another row, which followed comments from Mr Cameron that migrant camps like the "Jungle" in Calais could move to England if the UK left the EU. UKIP said the PM's claim was "based on fear, negativity and falsehood". French government said it had "no plans" to change the agreement .